My child’s teacher has suggested that I have my child evaluated for some possible difficulties that are interfering with school success. At this point we don’t know if we are dealing with an attentional disorder, learning disabilities, or even potentially something as serious as an autism spectrum condition. I’m concerned, however, that such an evaluation will lead to a diagnosis and that the diagnosis will end up labeling my child. Yet I want to do what is best. What would you suggest? I understand your concern and it’s one that I hear often. There are at least two different ways to consider this scenario however. Let’s be thankful that your child’s teacher raised their concerns with you. That was an act of love and one that allows you to made the best decisions in the interest of your child while not relying on the school, who services hundreds of children, to determine when your child’s needs meet a certain threshold to warrant further investigation. I hear your concern about “labeling” your child with something like ADHD. To some degree, I think this was a greater concern years ago when the resources to help children with additional needs were not as prevalent. At that time, children with such needs were more likely to be labeled and then shunned. Now, however, an accurate diagnosis is the first step to acquiring appropriate help if and when it is necessary. Furthermore, a diagnosis helps but a framework around the signs and symptoms you’ve already been trying to manage already. Once you have the diagnosis, you can get a better understanding of what the source of the difficulty is, what an expected prognosis is, and what treatment will be helpful. From that standpoint, a label as you refer to it, can be very helpful. We’ve all heard the cliché’ “Knowledge is power,” and while that has some merit, I believe it’s more accurate to say “Applied knowledge has power.” In this case, what I mean is that, once a child (or adult) has been evaluated and an accurate diagnosis is made, we have knowledge that then allows us to seek appropriate intervention. In the school system and in the medical and mental health communities, until a diagnosis is made, no intervention can or will occur. So from that standpoint, a label is helpful. On the other side of the argument, I’ll be very honest with you and tell you that if I never had to give another patient, parent, or insurance company another diagnosis, I probably wouldn’t. I know I just told you about advantages of an evaluation with a resulting diagnosis, but ultimately, the advantage or disadvantage comes from what we do with the information. Too often I see people use such a diagnosis (or label as you called it) as an excuse that limits their potential. The enemy likes to give us labels to steal from us, demean us and limit us. Unfortunately, those are lies that we all too readily come into agreement with. 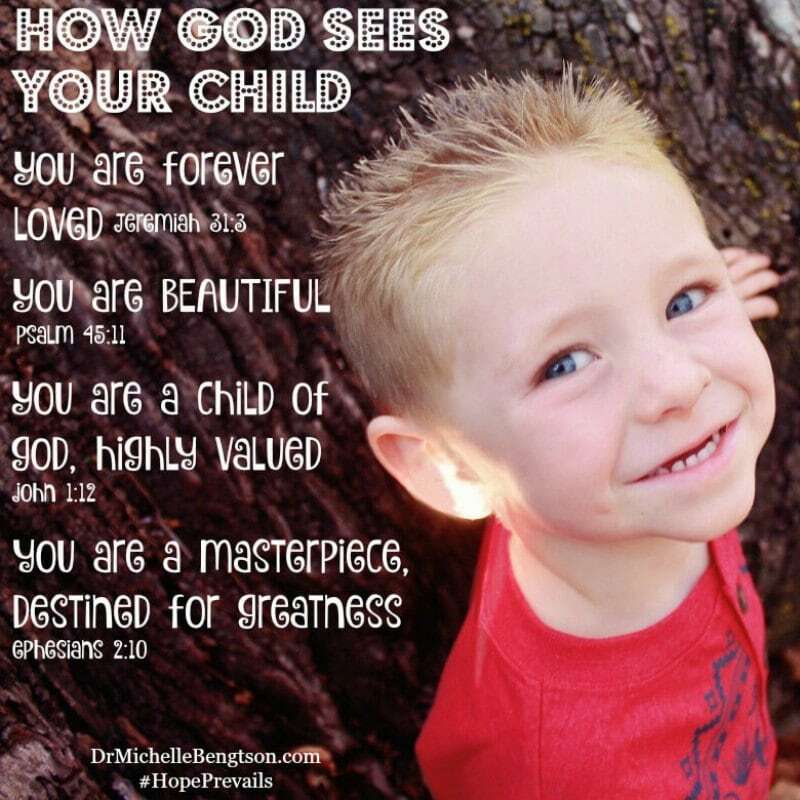 The labels you want to teach your child to identify with are the ones his or her Heavenly Father declare in His word. I find that all too often, the people I speak to don’t know what the Bible says about how God views (labels) them. -They not only fit in, they are accepted in the beloved (Eph 1:6). -God has already promised that they are not only a citizen of heaven (Eph 2:6, 19, Phil 3:20, and Col 1:12), -but also a joint heir with Christ (Rom 8:17, Gal 4:6-7). -they are a friend of Jesus (John 15:15). –Jesus makes them worthy (2 Thess 1:11-12). Let’s face it, we all wear labels, whether they are official diagnostic labels or just those our teachers, bosses, spouses, or we ourselves have given us. Let’s be an advocate for our children, use wisdom, get them the help they need, and be appropriate models for them, teaching them which labels are accurate and line up with God’s truth! Thank you for a balanced post. I wish labels weren’t necessary to get children the services they need, but I can understand the reasoning behind it. I have a child with a rare genetic condition. He qualifies for an autism diagnosis. He’s not “autistic” he has a neurodegenerative disorder. But slapping AUTISM on his forehead opens doors for therapy. It’s a little crazy making. Very well said! I spent 15 years teaching children with some learning problem or another. They learned differently and when that difference was identified and changes were made, the child no longer questioned if they were “just not as smart”. Later as a Licensed Professional Clinical Counselor, I had to make diagnoses. I knew they were hard to hear many times and I didn’t like to do them. I had a brother who had many issues and was given more than one label in the “dark ages” of mental health. I knew how they affected him and my parents. Thankfully, even though we have much to learn, we have steadily moved forward and have so much to offer when we identify the problem as you state. I now have a granddaughter with a diagnosis and her parents had been reluctant to have her evaluated, but it has made such a difference in their understanding and hers and her learning experience is now so much more positive. My own bias is the earlier we can identify whatever the issue is that is getting in the way from a child being able to experience being the best he can be, the better for the child and the less assault on their sense of identity. Thanks for this – I’ll be sharing this coming week. I have resisted a full diagnosis and label. We probably would have gone that way if we sent our son to school as it would have accessed additional help – but as a homeschool family, I had some tests that gave me some direction in helping him find strategies to succeed. My idea was – if my theories of teaching and training my child work then he’ll have a label unnecessarily – and this is how it has turned out to be. He can verbalise his struggles in a new context so people can work with him, but overall he can keep up in ways that his initial tests indicated that he wouldn’t. I so appreciated you lining up God’s assessment of us/our kids. Great perspective to give our kids! Hello! Stopping by from #DanceWithJesus Friday. It was definitely a divine appointment for me this morning. You have no idea how much this speaks to me right now. I am the person who never wants to label my children except for what God says about them. I want to protect them from the “you can’ts” of the world and let them know they can do anything in Christ. So when a teacher tells me maybe my child needs to be tested, I have a hard time receiving that information, knowing that I’ve homeschooled for years and know what works for her. Here again I sit in a limbo stance. Amen! Our children need to know they are loved and treasured, by us and by their creator! I worked in the school system for many years and saw both sides of your thinking too. But I think it boils down to attitude and what you teach your child about life no matter the “label.” Thanks for shining a light on this subject. Such a well thought out and wise response to concerns about labeling. Many year ago, when my son’s preschool teacher pulled us aside to say that she was concerned our son had ADHD, I responded with sadness, but as you said, once I was armed with the knowledge to know how to move forward and then took action with that knowledge, we were able to work with our son to do what was best for him and to give him the best possible environment for his diagnosis. I’m sure if you asked my son who is now 27 what I always used to say to him, he would respond. “ADHD is not an excuse for bad behavior or thinking that you “can’t” do something.” My son is now a highly revered and respected corrections officer who overcame the obstacles of ADHD. I praise God for the early intervention from his preschool teacher. Well said! 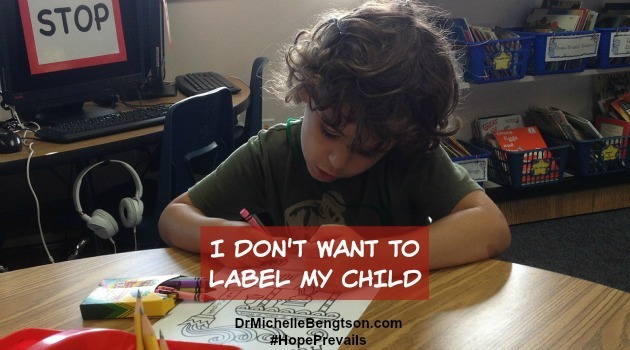 I’m a teacher and often we will get a student whose parent doesn’t want to ‘disclose’ their label. But it’s so much better to know and use the right tools to help! Great advice here! Excellent and beautifully said. Oh, that parents would be mindful to teach the beauty that their children are in Christ instead of comparing them to the world.